The PSP products performed as usual - the best on the market! The floor came out perfectly. My team was pleased with the results and the customer was very happy! “Like our work for Nemours Children’s Hospital and the dormitory at Seaton Hall University, PSP has enjoyed great success with VB 225 in demanding environments where traffic volume and sensitive floor coverings mandate the highest performing moisture vapor mitigation solution,” explains Peter Trainor, VP of Sales at PENETRON Specialty Products. 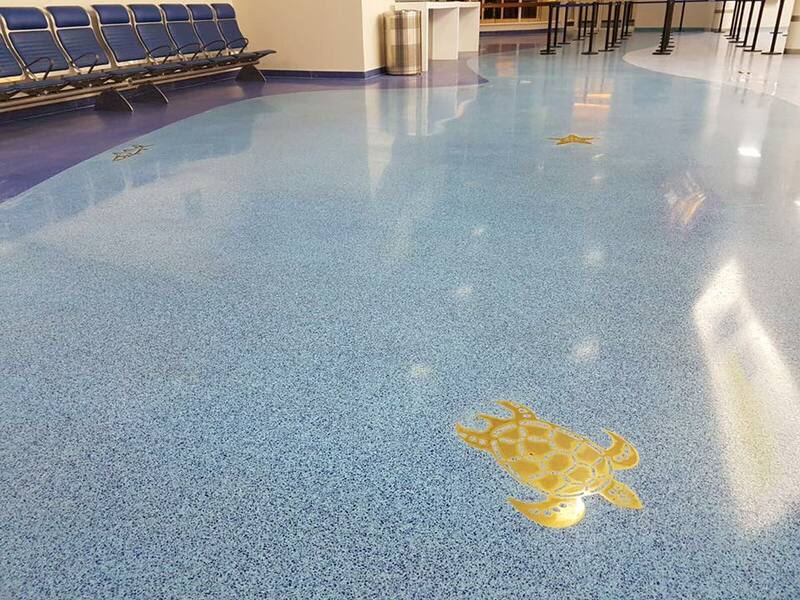 Follow the turtle: The Aruba Airport’s new epoxy terrazzo flooring with inlaid figurative medallions representing local fauna has a VB 225 moisture mitigation layer to keep everything dry and smooth. The pause that refreshes (a floor): A look at the new Aruba Airport terminal floor with the VB 225 moisture mitigation layer, prior to installation of the final flooring.